Happy 2nd day of the 31 Day Challenge! Oh my gosh! I just have to tell you I was overwhelmed, shocked, humbled, and excited all at the same time at the amount of folks that read my Day 1 post. Thank you Nester, Melissa and everyone else for hosting such a fine idea. I love that we’re all taking this get clutter free journey together. One thing that is important to know is for the month of October your home may get a bit messy or out of sorts sometimes. But that’s okay ’cause there will be light at the end of the tunnel and we’ll be celebrating on Nov. 1! I know everyone is busy so I thought it would be good to have task days mixed with tip days. This way, if ya need a little extra time to do a task you’ll have it. Sound good? Today is a task day and it’s all about eliminating the obvious. Did everyone get their supplies together? You won’t need them all today, but it will be nice to have. Here they are in case you missed Day 1. Before we get started I want to tell you a story that just recently happened to me. I work a 40+ hour job outside of the home each week and recently changed jobs and locations within my company. I moved out of an office I had been in for 10 years and I told myself I wasn’t going to take all of my personal belongings to my new location, but would first take everything home. I never knew until I started boxing stuff up, how much I had accumulated in the past 10 years. Every time I brought in a new picture I just found additional space on my desk. If I won an award I’d put it on a shelf or the wall and then another and another and another…If one of my co-workers gave me a gift or a card I wanted to make sure they knew I really appreciated it so once again, full view display. Are you sensing a pattern yet? I’ve now been at my new job in my new location for 2 months and those boxes of personal belongings I brought home are still on a shelf in the garage. And guess what? I haven’t missed any of it. I’m telling you this because it’s exactly what I’ve done in my home which I have lived in the same exact amount of time I was in that office. My guess is that some of you can easily relate and plead guilty to the same. Am I right? YOUR TASK FOR TODAY, DAY 2: Grab your empty laundry basket or empty box, spiral notebook , post-its and something to write with. Go through every room in your house. In each room, take a visual scan of everything on the tables, walls, shelves, counter tops, etc. You’ll probably see some things that could fall into one of a four categories. Place the items that fit into categories 1 and 2 into the laundry basket. Set category 3 aside for Day 3 and 4 tasks. For category 4, just leave the items where there at and attach a post-it-note to each. Put a big fat question mark on the post-it. Put the laundry basket and Category 3 some place where you won’t look at it like the garage, a spare room, a closet, etc. Just because you’re putting it in the basket doesn’t mean you’re getting rid of it……yet :-). For right now it only becomes out of sight, out of mind. We will come back to it, promise. The spiral notebook is for jotting down any questions you may have for me or just any random thoughts that come into your head. Good luck, have fun and you better let me know what’s going in the basket and what’s staying on the wall with a post-it. 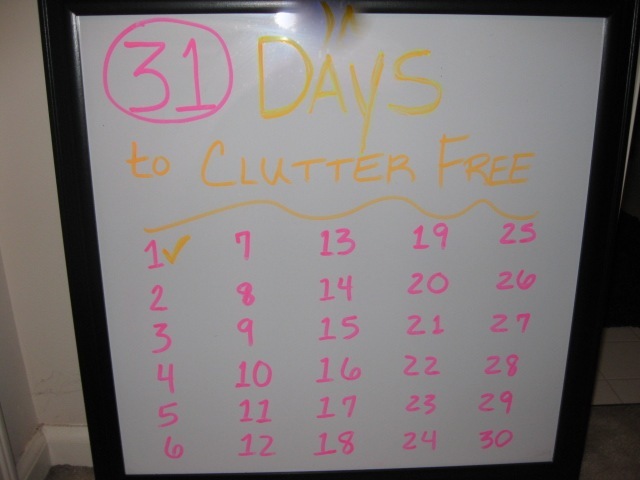 This entry was posted in 31 DAYS-CLUTTER FREE and tagged 31 day, clutter, label maker, labels, organization. Bookmark the permalink. Hi Tammy – good luck tomorow with your home walk through. Keep me post..ed (lol) how it goes for you. I am just loving your suggestions to become clutter free; as I have made so many futile attempts. Thankyou! I am enjoying your series. I am working on decluttering my home office. Thanks for all the suggestions. Heather, thank you for letting me know you’re following…appreciate it.. Once you get your home office done take a picture of it, pat yourself on the back and smile!